Country Boy is a big fan of muesli for breakfast in the morning. I guess it gets him filled up for a day of physical activity. Unfortunately most of the pre made mueslis are high in oats and bran sticks (which are cheap) with not much of the good stuff. Not many fruits or nuts. After a few times buying the premade version, we decided to have a go making our own. We have been making it for many years now, and it is quick to make and delicious to eat. The nuts and fruit we put in change from time to time, but the basic idea remains the same. 200g dried apricots (use the Australian ones - much darker orange and stronger flavour. 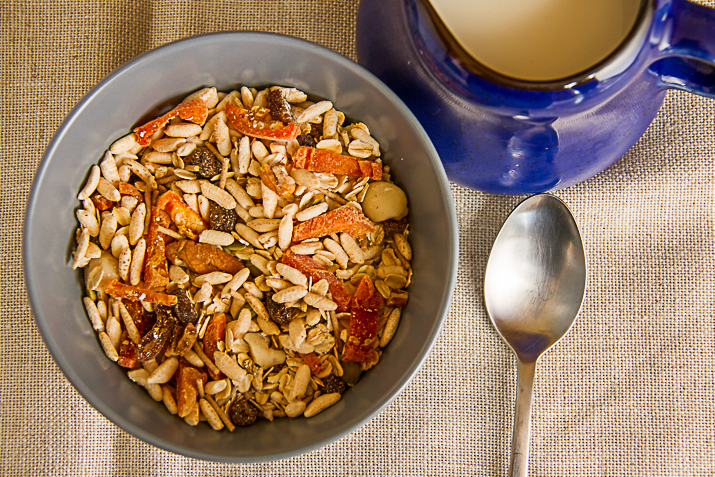 In a large bowl or cereal bucket, pour in the rolled oats, bran sticks, rice puffs, pepitas, and sunflower kernels, and sultanas. While the nuts are still in their bag, bang them with a mallet or rolling pin to break into small pieces. Use a knife to chop the apricots and dates into small pieces. 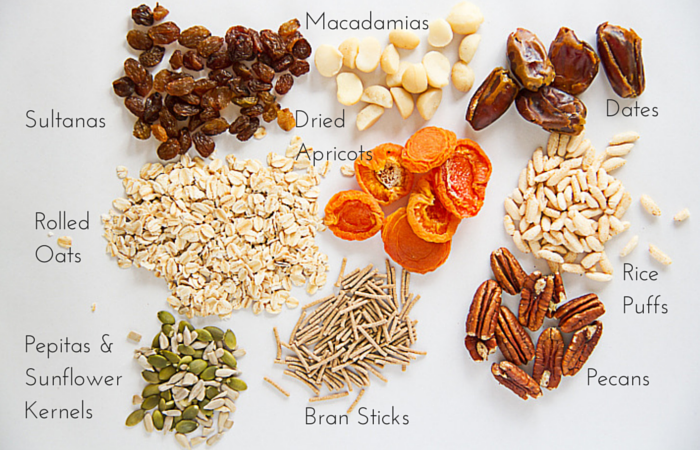 Place the nuts, apricots, and dates into the dried ingredients, and toss to combine. Store in a airtight container until needed. This quantity filled and 8.5L cereal bucket. Enough to keep CB in muesli for the next couple of weeks. We could never go back to the shop bought stuff now! So much more taste in our version! I'm glad it is working for you… we are still using it here with success. 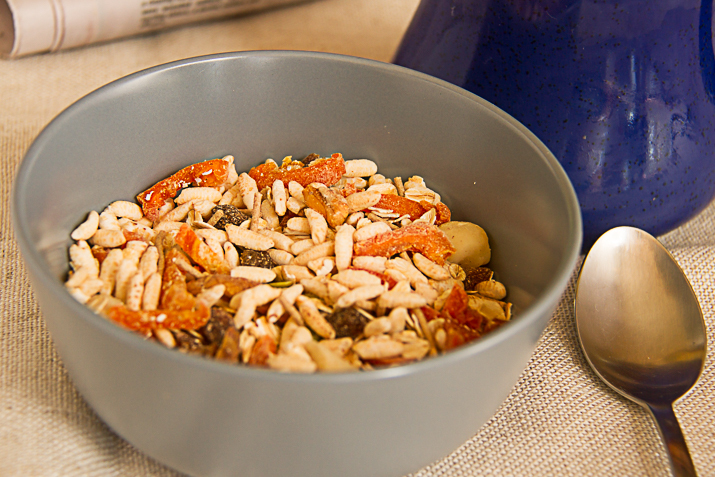 Enjoy your muesli! Zadada has been saying for ages that we need to make a batch of homemade muesli, you just given me the inspiration and recipe we needed Jo! Thanks so much for joining in with our Fabulous Foodie Fridays Party. Never thought to add rice puffs, thanks for the idea. Three is two more than I have. I'm a creature of habit for breakfast. I do occasionally make pancakes on the weekend for the family. I have three breakfasts that I rotate: homemade bircher muesli with extra apple; porridge with brown sugar; tomato, spinach and eggs on sourdough. That's it. I am not very inventive first thing in the morning!! It just makes it a bit lighter. I used to toast it occasionally, but these days they all prefer it untoasted. I might try coconut next time! That looks like a great muesli mix. I alternate between porridge, with berries in summer and apple/pear and cinnamon in winter, and homemade muesli. 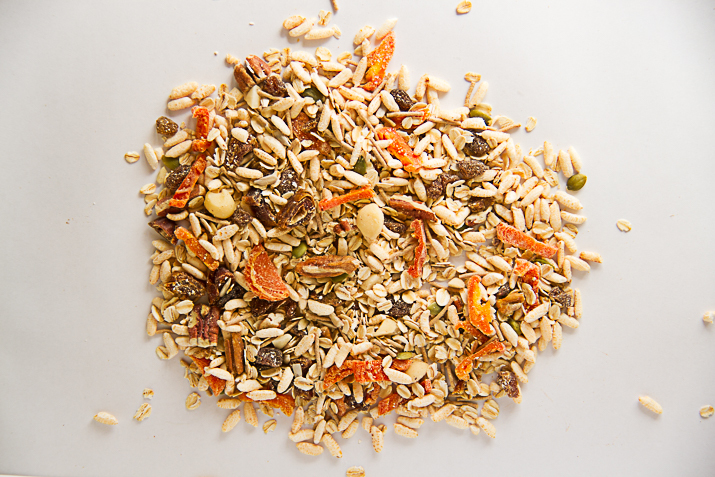 Our muesli mix is similar to yours – oats, puffed rice, sunflower seeds, pumpkin seeds, chia seeds, dried coconut, nuts (usually almonds), sultanas and sometimes dried apricots. Plain oats soaked in a minimal amount of milk. When sons were small I used to do as you do but roasted the oats with honey. Too sweet for me and easy to burn. Otherwise we ate Weetbix. I was brought up on porridge every day which Dad made. On summer holidays we were allowed a treat of Weetbix. Winter time away in mountains was still porridge with perhaps toast as an extra to fill us up.